Decrease recovery time from injury up to 80% with the FDA approved, patented, proprietary, and proven ARPwave system, even avoiding surgery in many cases. For example, we have helped many victims of car accidents who have suffered for months and even years from symptoms of whiplash such as neck pain, headaches, and loss of mobility. Many of these individuals had tried everything before eventually finding ARPwave therapy. 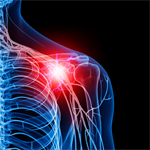 In most cases we can immediately reduce the pain 25% or more in the very first treatment. For more about whiplash relief, read more HERE. Listen to this quick one minute Success Story of how ARPwave was able to save a rock climbing trip for a father, with his two sons. "I was 3 weeks away from a rock climbing trip that I really wanted to go on and I couldn't hold a cup of coffee in my left hand! They said they could fix me. And on that tight time line, they did the job, the trip went off as a success"
Many sports injuries are overuse injuries, which are often the direct result of an athlete repeating a specific movement over and over, attempting to perfect that movement through sheer determination and stubbornness. What most athletes don't realize is that the pain they feel from an injury is not the location of the injuries point of origin. At Neuro Sports Performance and Rehab in San Antonio, TX, rather than just treating the pain, we use the ARPwave system to locate the true cause of the pain by treating the injuries point of origin. We call this "targeting the neurological origin of the soft tissue injury". When an athlete is suffering from a soft tissue injury, the injured muscles are no longer able to absorb force or provide support correctly. When this occurs, the body will compensate by redirecting that force to parts of the body not intended to absorb force such as your ligaments, tendons, joints and bones. Further muscles imbalances and pain is caused by our body's attempt to stabilize the injured area. This creates a vicious cycle where the athlete is spiraling downward, in pain resulting in missing practices and games, ultimately shortening their season. At Neuro Sports Performance and Rehab in San Antonio, TX, we can get athletes and everyday people alike, back to the game 80% faster than with traditional medicine. We are taught that the long head of the biceps tendon cannot come out of its groove, which is medically correct. HOWEVER, the long head of the biceps tendon CAN ride on the outside of that groove and when it does, it NEUROLOGICALLY shuts down the signal for those associated muscles to absorb force. When this occurs that force is sent to areas of the arm NOT meant to absorb force such as tendons, ligaments and skeletal structure causing pain, discomfort and long term damage to the elbow and shoulder region. Thus necessitating the need for the dreaded Tommy John Surgery and NO amount of physical therapy, ice, rest, compression or elevation can change this. This is a NEUROLOGICAL issue NOT a physiological issue. Neuro Sports Performance and Rehab, San Antonio Texas' exclusive Arpwave center of excellence for Accelerated Injury Recovery, Chronic Pain Relief, Rapid Post-Surgery Rehab and Neuro Sports Performance and Fitness Training.